Boilers can last for quite a long time. In fact, that’s one of the many reasons to have one. Fewer moving parts than other heating systems makes boilers more resistant to developing problems. Being more resistant to problems doesn’t mean that the boiler will last forever, though. Even if you take the best possible care of your boiler system, there will still come a time when you will have to replace it. The best way to tell for certain whether or not your boiler is in need of replacement is to have a technician check it out for you. If you’re not sure whether or not to call your technician yet, though, you can always check out the symptoms below to help give you an idea of whether or not it’s time for a new system. Boiler heating systems are known for their energy efficiency, as well as their longevity. If your boiler appears to be costing more to operate from month to month than it normally does, though, it might be because it’s time to replace it. The longer the system is in use, the more worn down it becomes over the years. Eventually, the wear and tear on the system will cause it to lose efficiency. The more the efficiency of the system drops, the longer the system will have to operate in order to achieve the same results. This added operating time contributes to higher heating costs. If this is why your boiler is costing more to use from month to month, then unfortunately the only thing to be done is to replace the system entirely. 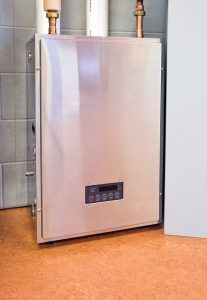 Considering that boilers are supposed to be resistant to developing problems, you should be concerned if yours is breaking down on a regular basis. If your boiler is breaking down often, that means that the system is likely worn down to the point where it’s getting close to the end of its life. The wear and tear on the system has progressed to the point that the parts inside are beginning to break down in groups. This will only get worse as the system gets older. You will likely save much more money by replacing the entire system now, than by waiting until it breaks down permanently. The average heating system lasts around 10-15 years before needing to be replaced. Boilers last a bit longer, frequently staying cost efficient up through 20 years. Past that point, though, they will tend to develop all kinds of chronic problems like those listed above. The system will simply be too worn out to continue operating efficiently, costing more and more to use until it finally breaks down entirely. If your boiler is older than 20 years of age, you should definitely contact a professional technician and see about installing a new one. PRK Services, Inc. offers a full range of boiler repair services in Denton, TX. If you need a new boiler installed in your home, contact us today to schedule an appointment with one of our professional technicians. We’ll make sure that you get the best boiler solution for your needs.